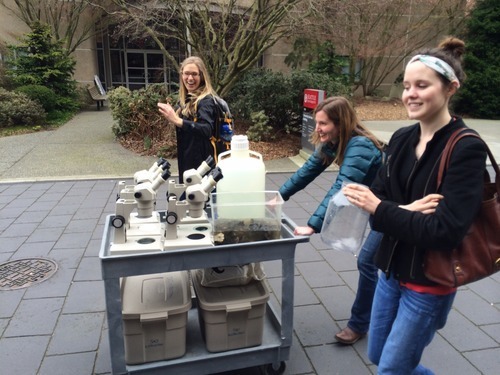 Last Saturday, with amazing help of Roberts Lab undergrads Jessica Blanchette and Katie Jackson as well as Anne Baxter from NOAA’s NWFSC, I led a workshop called ‘Flex Your Mussels’ for Seattle’s Expanding Your Horizons (SEYH) conference at Seattle University. The mission of SEYH is to inspire girls to pursue opportunities in STEM fields through exposure to role models and hands on activities. The Seattle conference hosted 46 different workshops (bacteria to fireworks) and had over 400 middle school participants!! 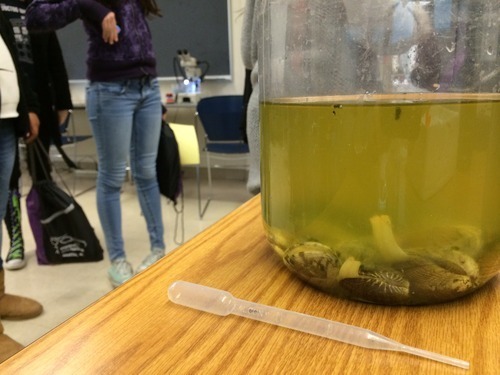 At the Flex Your Mussels workshop the girls learned about the amazing role of bivalves as natural water filters. 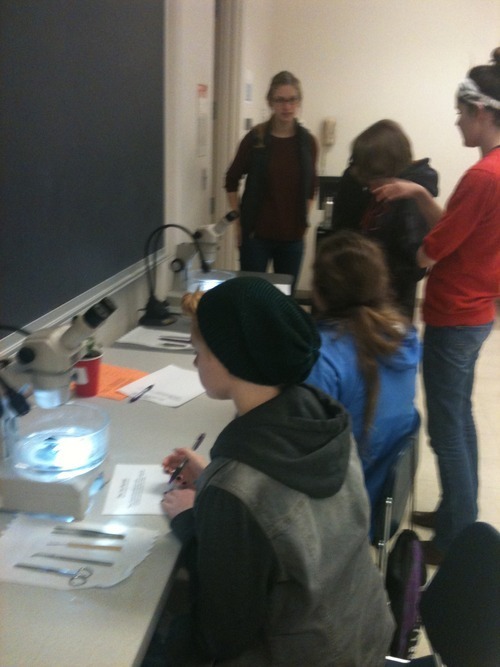 They were able to dissect their own mussels and watch them filter water and yeast on their ctenidia using dissecting scopes. 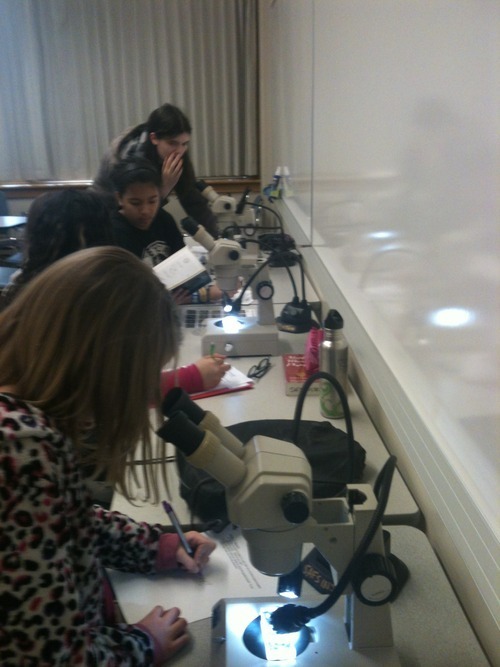 They also took a close look at what the bivalves were filtering by looking at plankton samples under the microscope. The girls were very curious and engaged throughout the workshop. 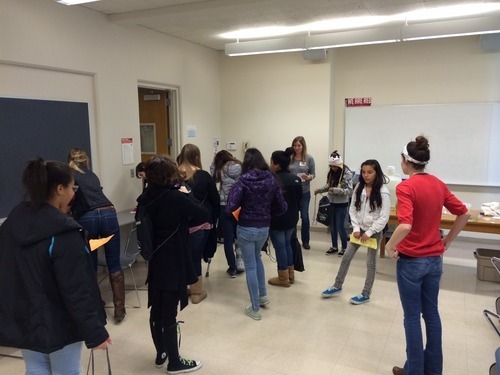 I think we all agreed that our favorite part of volunteering at SEYH was the curiosity and questions from the girls. It was a really fun day and I hope we get the chance to do it again next year. Big thanks to Jessica, Katie and Anne for being AMAZING teachers, role models as well as outstanding car packers! !